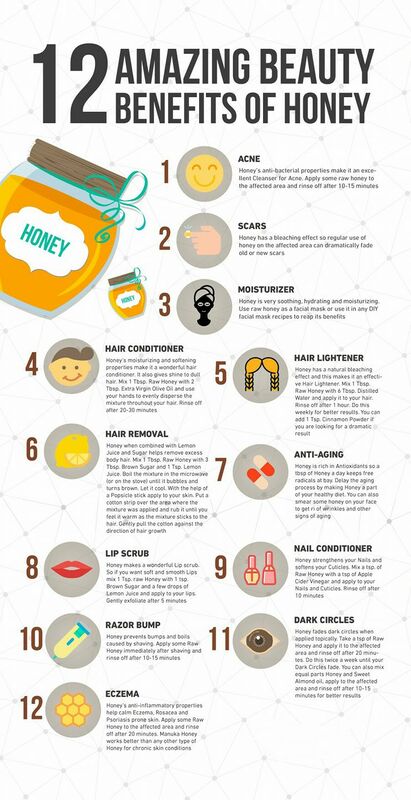 Home/11 Ways to Use Honey to Get More Gorgeous Skin, Hair, and Nails. This all-natural ingredient is good for so much more than sweetening up your tea or coffee. Hon ey’s often thought of as a healthier sweetener, but you might be surprised to learn that this ingredient has tons of skin and hair benefits, too. Made by the alchemy of bees collecting nectar, pollen, and resins from flowers, honey can help moisturize, fight aging, and fight bacteria. Plus, it’s loaded with nutrients, antioxidants, and healing compounds. Next time you’re browsing the grocery store shelves, look for raw honey, which hasn’t been heat-treated or pasteurized; it contains more active phytonutrient antioxidants and enzymes for enhanced benefits. Here are a few ways to put the ingredient to use (sometimes with the help of some other natural ingredients).